Calculate the emf induced in a generator. Calculate the peak emf which can be induced in a particular generator system. Electric generators induce an emf by rotating a coil in a magnetic field, as briefly discussed in Chapter 23.1 Induced Emf and Magnetic Flux. We will now explore generators in more detail. Consider the following example. 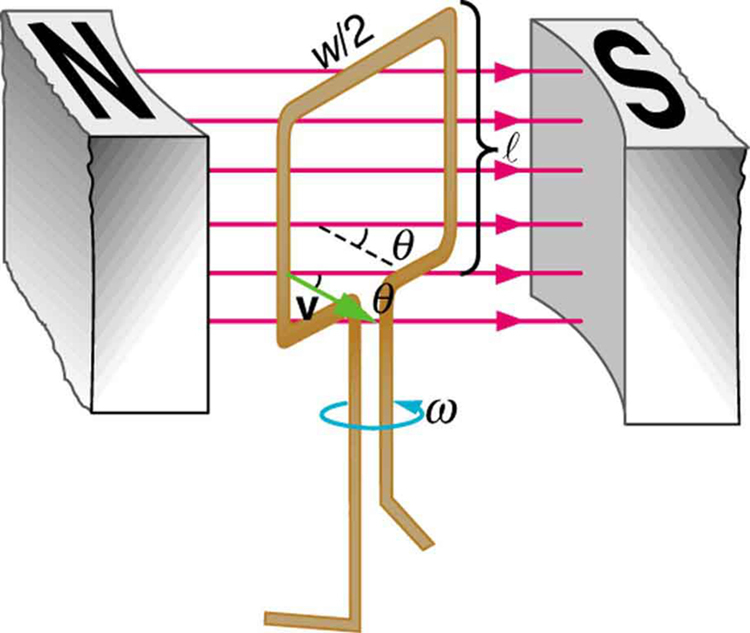 The generator coil shown in Figure 1 is rotated through one-fourth of a revolution (from to ) in 15.0 ms. The 200-turn circular coil has a 5.00 cm radius and is in a uniform 1.25 T magnetic field. What is the average emf induced? Figure 1. When this generator coil is rotated through one-fourth of a revolution, the magnetic flux Φ changes from its maximum to zero, inducing an emf. We know that and , and so we must determine the change in flux to find emf. This is a practical average value, similar to the 120 V used in household power. The emf calculated in Example 1 is the average over one-fourth of a revolution. What is the emf at any given instant? It varies with the angle between the magnetic field and a perpendicular to the coil. We can get an expression for emf as a function of time by considering the motional emf on a rotating rectangular coil of width and height in a uniform magnetic field, as illustrated in Figure 2. Figure 2. A generator with a single rectangular coil rotated at constant angular velocity in a uniform magnetic field produces an emf that varies sinusoidally in time. 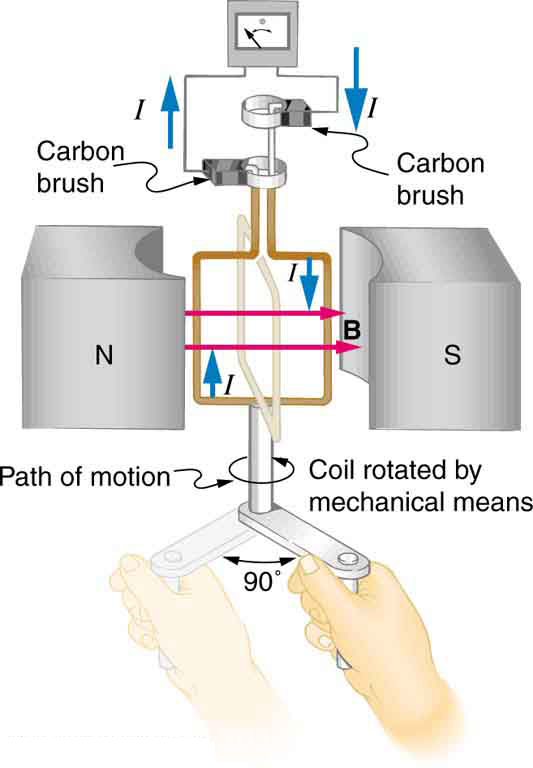 Note the generator is similar to a motor, except the shaft is rotated to produce a current rather than the other way around. is the maximum (peak) emf. Note that the frequency of the oscillation is , and the period is . Figure 3 shows a graph of emf as a function of time, and it now seems reasonable that AC voltage is sinusoidal. Figure 3. 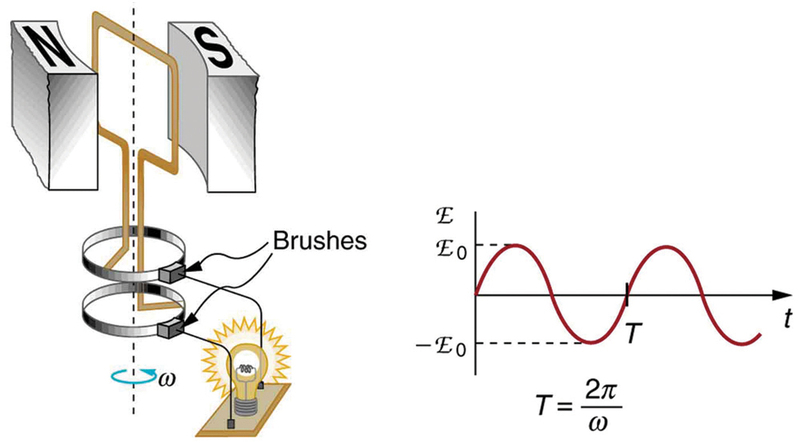 The emf of a generator is sent to a light bulb with the system of rings and brushes shown. The graph gives the emf of the generator as a function of time. emf0 is the peak emf. The period is T = 1/f = 2π/ω is the frequency. Note that the script E stands for emf. The fact that the peak emf, , makes good sense. The greater the number of coils, the larger their area, and the stronger the field, the greater the output voltage. It is interesting that the faster the generator is spun (greater ), the greater the emf. This is noticeable on bicycle generators—at least the cheaper varieties. One of the authors as a juvenile found it amusing to ride his bicycle fast enough to burn out his lights, until he had to ride home lightless one dark night. Figure 4 shows a scheme by which a generator can be made to produce pulsed DC. More elaborate arrangements of multiple coils and split rings can produce smoother DC, although electronic rather than mechanical means are usually used to make ripple-free DC. Figure 4. 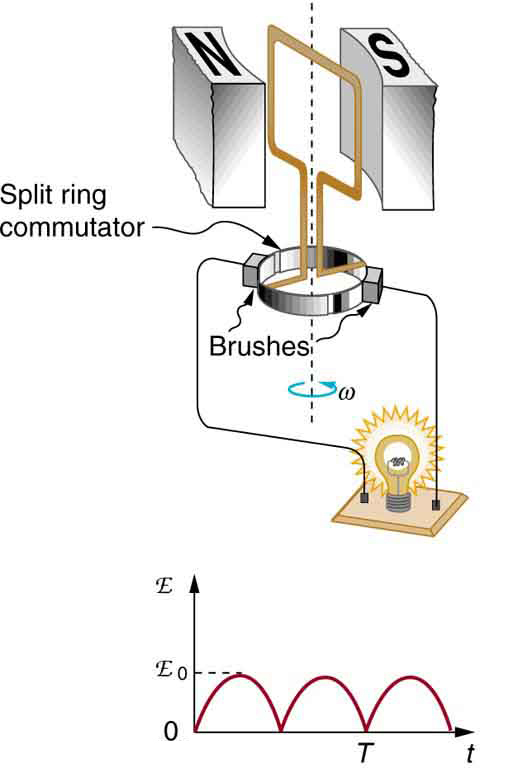 Split rings, called commutators, produce a pulsed DC emf output in this configuration. Calculate the maximum emf, , of the generator that was the subject of Example 1. Once , the angular velocity, is determined, can be used to find . All other quantities are known. The maximum emf is greater than the average emf of 131 V found in the previous example, as it should be. In real life, electric generators look a lot different than the figures in this section, but the principles are the same. The source of mechanical energy that turns the coil can be falling water (hydropower), steam produced by the burning of fossil fuels, or the kinetic energy of wind. 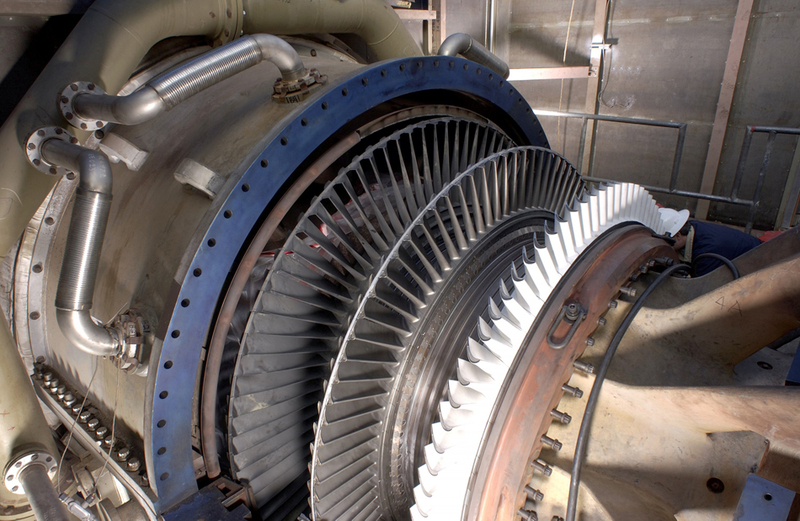 Figure 5 shows a cutaway view of a steam turbine; steam moves over the blades connected to the shaft, which rotates the coil within the generator. Generators illustrated in this section look very much like the motors illustrated previously. This is not coincidental. In fact, a motor becomes a generator when its shaft rotates. Certain early automobiles used their starter motor as a generator. In Chapter 23.6 Back Emf, we shall further explore the action of a motor as a generator. where is the area of an -turn coil rotated at a constant angular velocity in a uniform magnetic field . 1: Using RHR-1, show that the emfs in the sides of the generator loop in Figure 4 are in the same sense and thus add. 2: The source of a generator’s electrical energy output is the work done to turn its coils. How is the work needed to turn the generator related to Lenz’s law? 1: Calculate the peak voltage of a generator that rotates its 200-turn, 0.100 m diameter coil at 3600 rpm in a 0.800 T field. 2: At what angular velocity in rpm will the peak voltage of a generator be 480 V, if its 500-turn, 8.00 cm diameter coil rotates in a 0.250 T field? 3: What is the peak emf generated by rotating a 1000-turn, 20.0 cm diameter coil in the Earth’s magnetic field, given the plane of the coil is originally perpendicular to the Earth’s field and is rotated to be parallel to the field in 10.0 ms? 5: (a) A bicycle generator rotates at 1875 rad/s, producing an 18.0 V peak emf. It has a 1.00 by 3.00 cm rectangular coil in a 0.640 T field. How many turns are in the coil? (b) Is this number of turns of wire practical for a 1.00 by 3.00 cm coil? This problem refers to the bicycle generator considered in the previous problem. It is driven by a 1.60 cm diameter wheel that rolls on the outside rim of the bicycle tire. (a) What is the velocity of the bicycle if the generator’s angular velocity is 1875 rad/s? (b) What is the maximum emf of the generator when the bicycle moves at 10.0 m/s, noting that it was 18.0 V under the original conditions? (c) If the sophisticated generator can vary its own magnetic field, what field strength will it need at 5.00 m/s to produce a 9.00 V maximum emf? 7: (a) A car generator turns at 400 rpm when the engine is idling. Its 300-turn, 5.00 by 8.00 cm rectangular coil rotates in an adjustable magnetic field so that it can produce sufficient voltage even at low rpms. What is the field strength needed to produce a 24.0 V peak emf? (b) Discuss how this required field strength compares to those available in permanent and electromagnets. 8: Show that if a coil rotates at an angular velocity ωω, the period of its AC output is . 9: A 75-turn, 10.0 cm diameter coil rotates at an angular velocity of 8.00 rad/s in a 1.25 T field, starting with the plane of the coil parallel to the field. (a) What is the peak emf? (b) At what time is the peak emf first reached? (c) At what time is the emf first at its most negative? (d) What is the period of the AC voltage output? 10: (a) If the emf of a coil rotating in a magnetic field is zero at , and increases to its first peak at , what is the angular velocity of the coil? (b) At what time will its next maximum occur? (c) What is the period of the output? (d) When is the output first one-fourth of its maximum? (e) When is it next one-fourth of its maximum? A 500-turn coil with a area is spun in the Earth’s field, producing a 12.0 kV maximum emf. (a) At what angular velocity must the coil be spun? (b) What is unreasonable about this result? (c) Which assumption or premise is responsible? (b) This field strength is small enough that it can be obtained using either a permanent magnet or an electromagnet. (b) This angular velocity is unreasonably high, higher than can be obtained for any mechanical system. (c) The assumption that a voltage as great as 12.0 kV could be obtained is unreasonable. 23.5 Electric Generators by OpenStax is licensed under a Creative Commons Attribution 4.0 International License, except where otherwise noted.